2,801 backers pledged $128,300 to help bring this project to life. Now a member of an Economic Union, it has fallen on hard times, and its people are suffering. Corruption, inefficiency, and incompetence have a real human cost, as political tensions continue to increase. However, all is not lost. A group of investors (that some would call opportunistic) have seen this as an opening, a chance to build their own future. The players take on the role of these investors, who seek to bail out struggling businesses, recruit employees, raise capital, and produce goods for export. Shady business deals can win influence or grease the right palms, but players must be careful - cutting too many corners is inefficient and hurts the overall economy. In fact, it may even lead to bankruptcy for Axia and an early end for the game. But, with hard work and a focus on the future, the winner must seize opportunities where others see only crisis! The reprint of CRISIS is only for the Deluxe edition. It contains the same components as the first print run. Minor changes have been made to the rulebook (capitalization, FAQ) and to some cards (wording, clarifications). The rules of the game remain the same. Crisis is a game for 1-5 players that takes 45-120 minutes. For more details on the components and rules of Crisis, download the rules here (5 MB, right click and Save as…). Please download this file, as PDFs viewed in-browser may not display properly. This file is the low-resolution version of the final rules document. The first expansion for Crisis is here! It contains 15 new Company cards, each meant to replace one Company in the base game. However, not all are used in each game, dramatically increasing replayability. The fantastic illustrations for the new Company cards have been beautifully crafted by Anthony Cournoyer, the talented illustrator of the base game (and of Diesel Demolition Derby, and of Long Live the Queen's dieselpunk edition, and many more). You can download the rules card for the expansion here. This small new expansion forms the basis for much more content in the future, and we plan to put out more substantial, boxed expansions once we have fully developed and playtested them. La version Deluxe de CRISIS et l’extension La Nouvelle Économie sont maintenant disponibles en version française, éditées par Geek Attitude Games. L’extension ne sera pas disponible en boutique. Une présentation française du Kickstarter est disponible sur le site de Geek Attitude Games. Téléchargez les règles (non définitives) de CRISIS et La Nouvelle Économie. We have been able to, for the first time, develop our own German edition for a game! We are currently proofreading the language-dependent components: the rulebook, the events cards and the influence cards. In the post-campaign survey, you will be able to choose to receive the German edition of the base game and of the expansion. We are also working on a german-language conversion kit for the backers of the first print run. Would you like to try the game? We have both a Vassal module and Tabletopia implementations! You can find the Vassal module, handcrafted with love, here. You can get the latest version of Vassal here. Apologies, this does not contain the expansion. You can find he Tabletopia implementation here. Note that some videos below show prototype components which were created before the first campaign for the game. The game may look really good in these videos, but know that the final product is even better (rigid cards, appropriately-sized wooden tokens, etc.). Shipments to backers outside of the EU and the USA will have 45 EUR declared as the value of the package. That's roughly equivalent to 59 USD / 75 CAD / 76 AUD / 55 CHF / 6224 JPY. Note that we can not be responsible for any customs fees. The real cost of shipping is subsidized and is offered for the period of the campaign. We reserve the right to charge higher shipping costs during the pre-order period and beyond. We are not able to make bulk shipments. Other costs that we bear may also include packing materials, labor, freight, replacements shipping; and the risk of shipping cost increases. IMPORTANT: Do not add these amounts to your pledge! We will collect the shipping cost after the campaign, via Backerkit. We also have to pay 3-5 USD for materials, packing and handling - also something that you do not have to pay, resulting in discounts of 30-60%, depending on location and number of shipments. Individually it may not seem like a lot, but multiplied by thousands of packages, it represents a significant cost. Certain countries do not appear on the list of available shipping destinations. This is due to past experiences and potential cost overruns due to weight fluctuations. Click the pledge level and please contact us via KS message if your country does not appear on the list. We expect to have tracking for the USA, but not for anywhere else. If tracking is important to you, please contact us via the KS messaging system before the campaign is over. We do not expect to be sending tracking codes when the games are shipped. We do not offer add-ons (not even our other games) during the campaign, because we want to keep our operations simple and deliver efficiently. We will however be able to offer a post-campaign chance to obtain other games, if stock levels and our operations allow. We are in this for the long run, so it does not help us to squeeze a few more dollars from a few backers, if we would disappoint *all* backers. We have a reputation for shipping on time or early, and this is how we minimize the risk of missing our deadlines. Retail availability: We hope to put the game in shops, with the intended MSRP of 70 USD. However, we do not guarantee that you will be able to find it in retail, just like the game's first print run. SPIEL availability: We intend to sell the game at the SPIEL trade fair in Essen. We do not yet know the price, but we are confident we will have very few copies there. Special Thanks: Alvin Chen, Paul "GamingRules" Grogan, Dimitris "JamesH" Chatzidimitriou, Brittanie "Bebo" Boe, and many, many more. 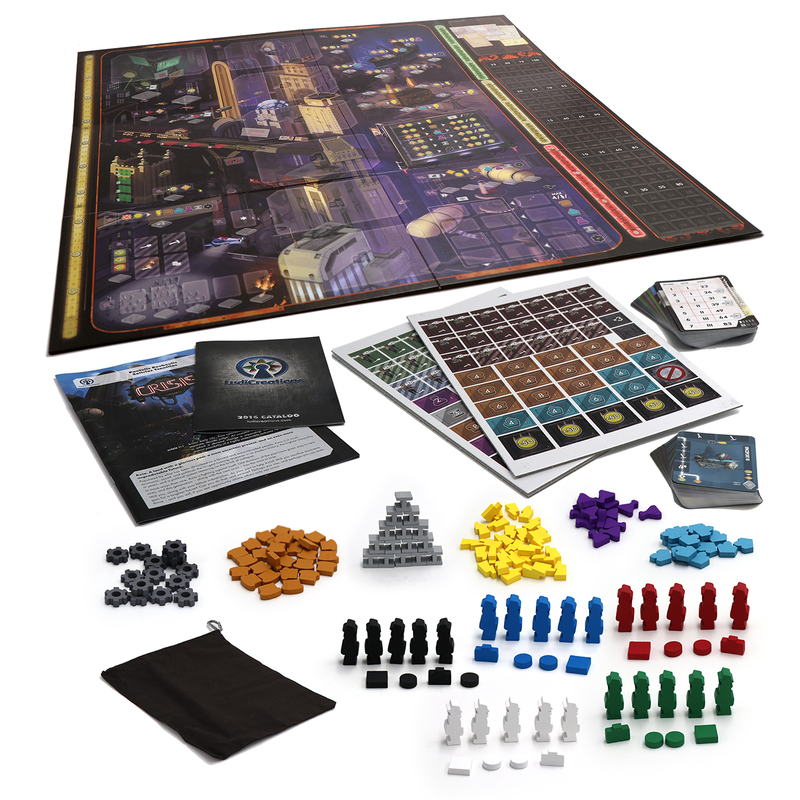 LudiCreations is a publisher of such novel games as …and then, we held hands, ESSEN, Kune v Lakia, Pocket Imperium, [redacted], and Town Center. Working with talented contributors from around the world, we create games with unexpected themes and mechanisms. Gather your friends, and turn wood and cardboard into joy! All previous campaigns have been fulfilled. We are working with a manufacturer we have worked with before, and we are confident in our ability to deliver the game and any additional materials. That said, unforeseen events may affect how quickly fulfillment is conducted, and the final graphics and components that you see presented here are subject to (however improbable) change. We will be exhibiting at Essen, and it is very likely that some backers or other people may have the game in hand before you do. Note that our goal is to ship the game on time, by the dates listed on the pledge levels. Shipping a package is different than delivering a package. We do not deliver your game, the shipping company does. Therefore, delivery times will vary according to your local postal services – once we ship, the shipment is the responsibility of the shipping company. If tracking is important to you, please let us know. Informal currency conversions made on this campaign may not be accurate by the time you read this, and therefore result in seemingly cheaper prices further in the future. Warning: Do not attempt to simulate, cause, or resolve an actual financial crisis using this board game. LudiCreations does not take responsibility for any massive unemployment, overall social malaise and a general depreciation of political ethos and/or civic values that may come about due to playing this game. The story, all names, characters, and incidents portrayed in this game are fictitious. No identification with actual persons, places, buildings, and products is intended or should be inferred, except maybe Nutella. By backing this project, you indicate that you have read, understood and agreed with the above. If you have any questions, please contact us directly via the KS messaging system. The New Economy company cards. They add controlled variability and change how the game progresses. You will be able to choose the german edition of this expansion in the post-campaign survey. We are also working on a german-language conversion kit for the base game. Shipping will be charged after the campaign, please do *not* add any shipping cost to your pledge. Please check the Fulfillment section of the campaign page for rates and policies. Contact us via KS message if your country does not appear on the list. The deluxe edition of Crisis with custom-shaped wooden tokens. You will be able to choose the german edition of the game in the post-campaign survey. The deluxe edition of Crisis with custom-shaped wooden tokens + The New Economy. You will be able to choose the german edition of the game and expansion in the post-campaign survey. Edition Deluxe de CRISIS avec les pions en bois personnalisés + l’extension ‘La Nouvelle Économie’. Belgique/France/Luxembourg 9 USD (7 EUR) - Canada/ Suisse 14 USD (11 EUR) - Retrait gratuit au prochain salon d’Essen - Autres merci de nous contacter par email. Les frais d'envoi seront ajoutés après la campagne. Veuillez à ne pas les inclure au montant de votre pledge. Les tarifs et conditions se trouvent dans la section VERSION FRANÇAISE.